Parents, Families, Friends and Allies United with LGBTQ People to Move Equality Forward in Kitsap County. 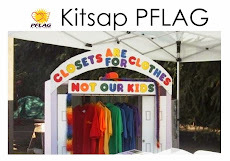 Kitsap PFLAG is the local chapter of PFLAG supporting everyone in Kitsap County. We offer a monthly support meeting and we perform advocacy and outreach on behalf of our local LGBTQ+ community. We meet on the third Monday of every month. Please subscribe to our newsletter by emailing kitsappflag at yahoo.com or follow us on Facebook to stay up-to-date on our meeting locations. You can also read our Blog for information about our chapter, but we update Facebook much more frequently these days.